We know you want value without sacrificing quality! Our new value pack of shimmering washi tape doesn't make you decided between the two! Each roll gives you countless opportunities to beautify just about anything you could imagine. Children love the simple, yet effective way of bringing color to electronics, cards, decor, and gifts. Our self adhesive backing is perfect for all of your crafting needs. Simple peel, tear and stick! Let your creativity take over! 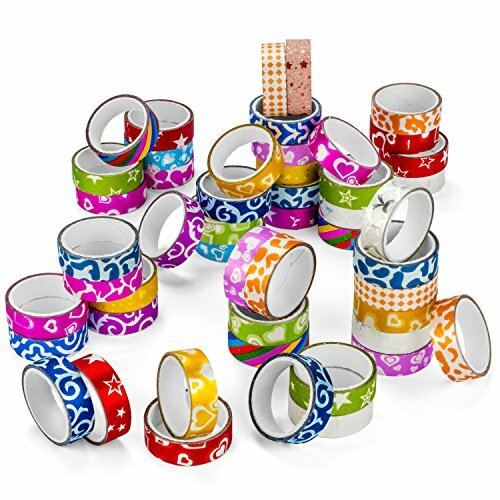 Go ahead...let your creativity shine as bright as this washi tape does! Classrooms will finally get the makeover they deserve. And don't even get us started on that planner that all of a sudden gives you the burst of energy to check something off of that to-do list! Give your child a confidence boost! Your little one will adore their new personalized piece they created while they learned more patterns, colors, designs and shapes. It really is that easy! See for yourself! Click "Add to Cart" now and bring home your new favorite craft necessity! 50 PACK SET - Includes 50 rolls of washi tape measuring 1/2 inch thick and 108 inches in length giving you more for your money! NEW STYLE - Glitter Patterns with the most vibrant color assortment that brings beauty to any Birthday, Holiday, Christmas gift or craft! MULTI USE - The self adhesive backing sticks, molds, and cuts easily giving you more time to create and less time fidgeting with glue and cleaning up messes. PERFECT GIFT - Spruce up old electronics, bring some life to your boring scrapbook, give that personal touch your birthday cards or purchase as a gift for the crafter in your life! Peachy Keen Crafts is a family owned company, so we treat you like family! We offer a 100% Satisfaction Guarantee. If you are unhappy for any reason, let us know and we will issue a full refund. If you have any questions about this product by Peachy Keen Crafts, contact us by completing and submitting the form below. If you are looking for a specif part number, please include it with your message.